Xander Bogaerts returns to the Red Sox lineup tonight after missing out in the first game against the Rays with a neck injury. David Ortiz is the odd man out in the middle game tonight and will be replaced by Yoenis Cespedes at DH. 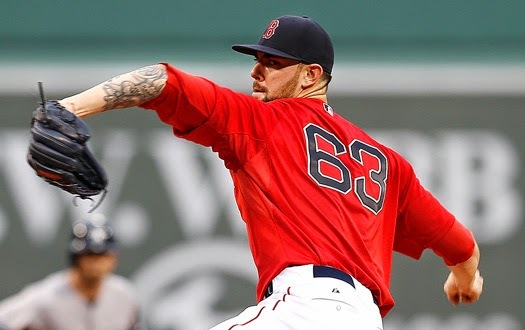 The Sox will be looking to finish strong in front of the home crowd tonight behind Anthony Ranaudo (3-3, 5.29 ERA), who is making his 7th start tonight. He'll be looking to make one final impression this season to solidify his spot for the rotation next year. And while he's made some solid starts this year, he's been hurt by the home run this year. He's given up 10 home runs in his previous 6 starts, and he'll have 1 more chance this season to rectify that against the Tampa Bay Rays. He'll be opposed by Jake Odorizzi (11-12, 3.98 ERA), who has been so-so in his last 3 starts. He's 1-1 with a 3.57 ERA and only 8 punch outs in 17.2 innings pitched, but he's had success against the Red Sox in the past, posting a 1-1 record and a 2.86 ERA and 20 K's in 22 IP. The Red Sox will look to rectify that tonight as they look to even the series against Tampa.